﻿ Using Stones for Personal Growth. Aquamarine or Starry Jasper: Freedom of Self-Expression. Aquamarine is a transparent pale green or pale blue variety of beryl that gets its color from small amounts of iron in the stone. Rough aquamarine crystals are fairly common, and they have a striated appearance, somewhat like tourmaline. Lighter aquamarine is sometimes heated to enhance its color by changing it to a darker blue. The most important mines are in Brazil, Malagasy Republic, and USA. Aquamarine gets its name from the Latin, which means sea water, and was used as a talisman for Roman sailors. Beads of aquamarine have also been found in ancient Egyptian mummy pits. 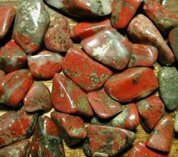 An alternative stone that can be used instead of aquamarine is Starry Jasper. Starry jasper puts out the same type of subtle energy as aquamarine, but it is usually not as readily available. Starry Jasper is a pretty chalcedony (micro-crystalline quartz agate) that comes from Australia. 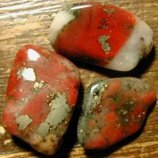 It is an opaque stone that can contain areas of red, gray, black, or even white. This variety of coloring can make it difficult to recognize, but identification is made easier by the obvious flecks of golden pyrite that always appear on the surface to give it a very attractive sparkling effect. It has been used by the indigenous people of Australia both as adornment and as a shamanic stone. 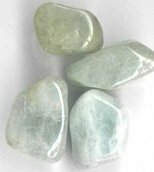 The vibrations emanating from the crystalline structure of Aquamarine (as well as Starry Jasper) interact with your personal energy to strengthen Freedom of Self-Expression. Freedom of self-expression is being yourself, being who you are, expressing who you are by letting your real self come out. It is feeling that you don't have to hide your real self. It is an empowering attitude or human quality that lets you choose how to express what is inside you. Freedom of self-expression includes freedom of speech, but it is more than that. It is expressing whatever is inside you in any manner you choose, whether you do it with words, or in art or music, or by the clothes you wear, or by inventing a new mousetrap. If you are free, you are also empowered. This allows you to claim your right to take charge of your own life, and not be afraid to be in charge of it. You know you don't have to ask others for permission to be who you are, and you don't have to take orders from people. Although freedom of self-expression is part of your right to control your own personal space, to be in charge of operating your own life, and to determine your own destiny, it does not allow you to impose yourself on people who don't want to hear what you have to say, or who are not ready to accept your viewpoint on things. Keep in mind that within your space your will is king, and within the space of others their will is king. So in expressing yourself, you must do it within your own personal space, or with the permission of others in their space. In other words, you do not have the right to force others to listen to you if they don't want to hear what you have to say. A feeling of freedom comes from understanding at a deep level that it is a basic human right to choose how to express yourself. This means you have the right to be in charge of your own life and act on your own behalf in expressing yourself, and in choosing how to reveal what goes on inside you, if you choose to reveal it at all. When you are empowered in this way you feel you don't have to hide your real self. In order to fully claim this right for yourself, you must not be afraid to stand up to people who try to make you conform to their lifestyle. Every human right has two sides to it, namely the right as it applies to you, and the right as you must let it apply to everyone else. And to be fair, the right must be the same for both. The consequence of this is that you have the right to choose when and how to express yourself without interference from others, and others have the right to choose how to express themselves without interference from you. This means you have the obligation to allow others their freedom of self-expression and independence in letting them choose how to express what is inside them. This includes not restricting people through censorship or other means that limit their free expression. When you allow people to choose how to express what is inside them, you also allow them to be empowered. If you have trouble feeling free to express yourself, you often feel you don't have a real choice in who you can allow yourself to be. You find it difficult to feel free to be yourself, to claim your right to express yourself as you wish. You are often afraid to do or say the wrong thing, or let someone see who you really are. You tend to feel repressed, inadequate and stifled, and you sometimes feel smothered in relationships. You can really only be yourself, be your own person, when you feel free to express what you think and feel. The less aggravation and stress you have in your life, the more you will feel at ease with yourself and those around you, and the more free you will feel to express what is inside you. Work at minimizing your burdens by making your life simpler and less complicated, and by involving yourself only in things that don't create trouble in your life. You may even wish to do a little down scaling. Keep in mind that "simple is beautiful", and when you simplify your life, it immediately becomes less stressful and burdensome. Keeping things simple disentangles you from much aggravation. It makes your life flow more smoothly, and gives you a greater amount of freedom in all aspects of life. Part of expressing your inner self comes from exploring alternative situations or looking into new and different things. There is freedom in exploring uncharted territory, in "going where no one has gone before", and in not being afraid to try new ways of doing things. Developing your spirit of adventure in this way helps you feel free to try new things and express yourself in imaginative ways, and in the process you often find new and better ways of doing things. Another way to enhance freedom of self-expression is to practice standing behind your principles, and be strong in supporting what you believe is right. When you understand integrity, you know there is a special kind of freedom that comes from being incorruptible and refusing to compromise your principles, because then you have nothing to hide and you don't have to worry about tripping yourself up by saying the wrong thing. Having principles also helps you recognize principles in others, and makes you feel comfortable and free in being with those people because you recognize their integrity. The ability to feel free to be yourself in a relationship comes from being compatible with the other person in several areas. One of these areas is seeing things from the same realistic perspective, that is, finding the same types of things credible and believable. To practice this, become more aware of what things you find believable and real, and become aware of the people around you who find those same kinds of things to be credible and believable. Having a similar outlook on reality gives you a similar perspective that make you optimistic about the same kinds of things in life. This creates a special compatibility with the other person that enhances your feeling of freedom to be yourself and to express who you are.